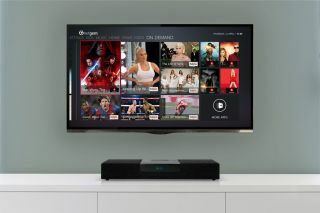 Netgem SoundBox HD combines soundbar, streamer and TV set-top-box into one | What Hi-Fi? We’re not ones to shy away from filling a living room with box upon box of glorious AV gadgetry. But the reality of modern UK living means that, as wonderful as a full Dolby Atmos 7.1.4 system is, many don’t have the time or the space for it. That’s where the Netgem SoundBox HD comes in. Part soundbar part TV set-top box, the SoundBox HD combines a Freeview HD tuner, on-demand and catch-up streaming services and a dual-tweeter, dual-subwoofer soundbar into a single box. It even supports Amazon Alexa voice commands. Netgem is a relatively new entry to UK, but its software and hardware has been at the heart of numerous well-received provider-branded set-top-boxes for more than 20 years, including the nifty EE TV box in the UK. That expertise has translated into some well thought-out specs for the SoundBox HD, as well as an award-winning user experience. Connectivity is simple—rightly so for a one-box solution—with an aerial socket, 3.5mm auxiliary input, gigabit Ethernet port and a single HDMI 1.4a port for up to 1080p video. There’s also built-in dual-band AC Wi-Fi, as well as a Bluetooth receiver for streaming audio from a phone. On the software side, Netgem’s interface is pleasingly clean and simple, giving you access to live TV, catch-up TV and streaming services like Deezer, Hayu, and Amazon Prime (with more on-demand and catch-up services to be rolled out over the coming months). The latter gives you access to 1,000s of popular movies and TV shows, including exclusive Amazon Prime original series and box-sets to watch at home or on the move. Best of all, there’s a year’s free Amazon Prime subscription included with every SoundBox HD (even if you’re an existing subscriber, you get an extra 12 months), which gives you access to Prime Video, Prime Music and Prime Delivery on all your Amazon orders. The Amazon integration extends to voice control too. Sure, there’s a remote if you fancy fumbling around with buttons, but if you have an Amazon Echo you can simply control the SoundBox HD by barking orders at Alexa. You can use voice search to find a particular channel on Freeview or a a film on Prime, play music with simple phrases like "Alexa, ask SoundBox to play BBC Radio 1" and even pause and change the volume while watching a show. You can even search live TV for a specific show. The Netgem SoundBox HD retails for just £249 as an introductory offer direct from Amazon UK including a 12-month Amazon Prime subscription. And, with Amazon's typically speedy delivery, it'll arrive in time for the World Cup too, ensuring you don't miss a moment of pre-match commentary.